4 Dance Costume Embellishments You Can Add Yourself! While designing your costume, we recommend talking to your costume company about any embellishments you plan to add yourself after receiving your dance costumes! This way they keep this in mind while creating your garment and may have some suggestions about the best ways to add those finishing touches. Pros: Appliques and embroidered patches add a layer of texture and depth to your costume. Floral appliques will add a delicate, feminine touch and patches will add some thematic flair! Cons: Appliques and patches don't stretch, so be mindful of that when applying to your garment! They can also be quite delicate, so they will likely need to be hand stitched, making them a labor intensive add-on. 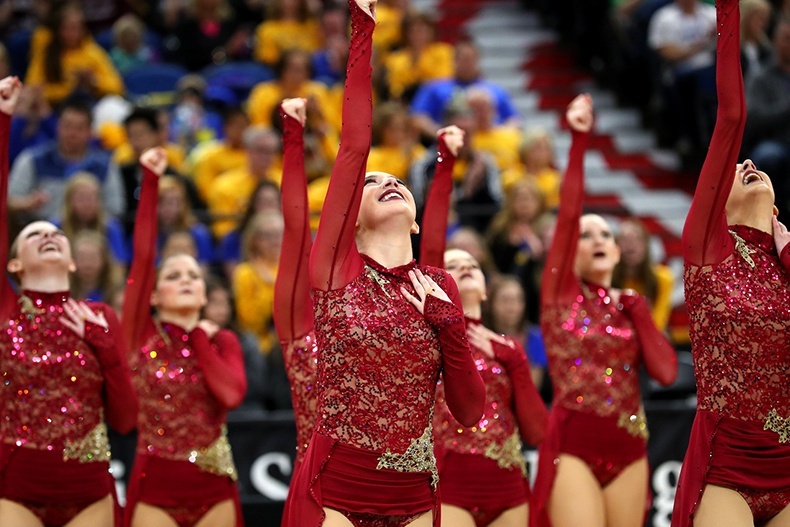 Benilde-St. Margaret Dance Team added their own appliques and rhinestones to their 2016 Jazz dance costume. Pros: Rhinestones give you the most sparkle from a distance and they are one of the easiest embellishments to apply yourself! Cons: While it is less expensive to apply rhinestones yourself, rhinestones themselves are still quite costly. They can also fall off easily if not applied correctly, so be sure to do your homework and research proper application techniques beforehand. Check out our How to Rhinestone video tutorial to help! 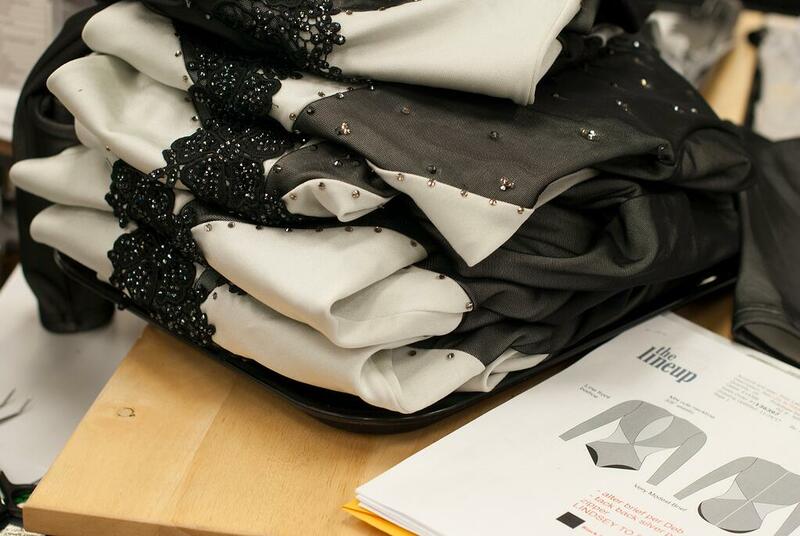 Pros: Individual sequins or sequin trim add a more cost-effective sparkle to your garment! Sequin trim is a lot less labor intensive, allowing you to add more sparkle with less effort. Cons: Some sequin trims don't stretch, so make sure to look for a stretch sequin trim so that won't restrict movement or restrict pulling your garment on! Throwback! Eastview Dance Team (left) applied individual sequins and rhinestones to their 2003 Jazz costume. Simley Dance Team (right) recreated the look for their 2017 Kick costume! Pros: Feathers and fringe are fun embellishments to add for movement and dimension! They also add thematic flair. Cons: They can easily fall off or shed - be careful if your competitions have rules against this! They also do not stretch, so be mindful of that when applying to certain places (like the hips) so that you can easily get into your costume later. BOLD Dance Team, Yackel Dance Studio, and Little Chute Dance Team all had unique ways of incorporating feathers into their dance costumes! There's no need to sacrifice all of your embellishment wishes for your dance costume because of your budget. Get creative and do it yourself to save some money!